Deep vein thrombosis ( DVT) is the occurrence of a blood clot thrombus ) is created in one or more of the deep veins inside the body, usually in your legs. Deep vein thrombosis can cause leg pain or swelling but may occur without any symptoms. Deep vein thrombosis can from if you have a particular medical condition that affects how your blood clots. Deep vein thrombosis can also occur if you do not m ove for a long time, such as after having a surgery, following an accident, or if you are confined to nursing home or hospital bed. Swelling in the affected leg. Rarely, are there cases of swelling in both legs. Pain in your leg The pain often starts in your face and can feel like cramping or soreness. Deep vein thrombosis may occasionally occur without any noticeable symptoms. If you develop symptoms of deep vein thrombosis, you should contact your doctor. If you develop signs or symptoms of a pulmonary embolism, note this is life-threating, with the complication of deep vein thrombosis. Seek immediate medical care. Chest pain or discomfort that deteriorates when you take a deep breath or when you a cough. 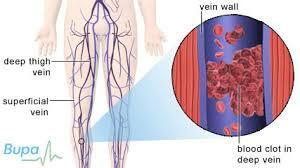 Deep vein thrombosis occurs when a blood clot forms in the veins that deep in the body, often in your legs. Blood clots cane be caused by anything that prevents your blood from circulating normally or clotting properly. Inheriting a blood clotting disorder – Some people inherit blood disorders that make their blood more prone to clotting. This condition may not cause a problem unless it is combined with other risk factors. Prolonged bed rest. Such as a long hospital stay or paralysis. When your legs remain still for long periods, your calf muscles do not contract to help blood circulate; this can increase the risk of blood clots. Injury or surgery. Injury to your veins or surgery can heighten the risk of blood clots. Pregnancy.Pregnancy increases the pressure in body’s veins, specifically in the pelvic and leg region. Women who also have inherited clotting disorders are, particularly at risk. The risk of blood clots from pregnancy can continue fro up to six weeks after you have your baby. Hormonal replacement therapy or Birth control bills. Birth Hormone replacement therapy and birth control pills (oral contraceptive) can increase the blood ability to form clots. Being Obese or Overweight – Being overweight increase the pressure on the veins located in the pelvic and leg areas. Smoking caused blood clotting and reduced circulation, which increases blood clotting risk. Cancer. Some forms of cancer increase the number of substances in the blood that cause your blood to clot. Even some forms of cancer treatment can trigger additional risk of blood clots. Heart Failure People who suffer from heart failure have a greater risk of pulmonary embolism and DVT. Since people with heart failure already have limited heart and lung function. Even symptoms called by a small pulmonary embolism are far more apparent. Inflammatory bowel disease. Bowel disease’s such as Crohn’s disease or ulcerative colitis, increase the risk of DVT. A personal or family history of deep vein thrombosis or pulmonary embolism. Being over the age of 60 increase your risk fo DVT. However, it can occur at any age. Sitting for long stretches of time driving, or flying. When the legs remain still for many hours your calf muscles don’t contract, which typically helps blood circulation. Blood clots can develop in the calves of the leg if your calf muscles are not moving for long stretches of time. One of the primary complications linked with deep vein thrombosis is a pulmonary embolism. Ultrasound – A transducer or and like the device is placed over the part of the body where there is a clot, The transducer emits sound waves into the are. As the sound waves travel through your site and reflect back signals to the computer, which changes the waves into moving images on a video screen. A clot may be visible in the image. Occasionally a series of ultrasounds are needed over several days to determine whether a blood clot is growing or be sure a new has not developed. Blood test Almost all people who develop severe deep vein thrombosis will have elevated blood levels of a clot solving substance called D-dimer. 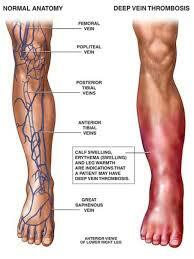 Venography – A dye (coloring agent) is injected into a vein in your foot or ankle. An X-ray procedure creates an image of the veins in your legs and feet to look for clots. In most cases, less invasive methods like an ultrasound can confirm the diagnosis. CT or MRI scan both computerized tomography (CT) scan and magnetic resonance imaging MRI can produce visual representations of your veins and may show if you have a close. Sometimes a close is found when these scans are performed other reasons. Deep vein thrombosis treatment is focused on preventing the clot from getting larger, as well as limiting the clot from breaking loose and causing a pulmonary embolism. After that, the goal becomes diminishing your chances of deep vein thrombosis transpiring again. Blood thinners – Medicines used to treat deep vein thrombosis include the use of anticoagulants, also sometimes called blood thinners. These medications lessen the blood’s ability to clot. While they do not break up existing clots, they can prevent clots from getting bigger or reduce your risk of developing additional clots. Usually, you will first be given a shot or infusion of the blood thinner heparin for several days. After taking heparin injections, your treatment may be followed by another injectable blood thinner, such as enoxaparin (love not, fondaparinux (Arixtra) or dalteparin (Fragmin). Other blood thinners can be given in pill form such as rivaroxaban (Xarelti) or warfarin (Jantoven, Coumadin) Newer blood thinners also may offer additional options shortly. You may require taking blood thinners for three months or longer. It’s essential to take your medications precisely as your doctor instructs. Blood-thinning medications can have severe side effects if you take too much or not enough. You may need a periodic blood test to check how long it takes your blood to clot. Pregnant women should not take certain blood thinning medications. One group of medicines is recognized as thrombolytics. These drugs, called tissue plasminogen activators (TPA) are administered through an IV line to split up blood clots or may be delivered through a catheter put directly into the clot. These drugs can cause serious bleeding and are used only in life-threatening situations. For these reasons, thrombolytic medications are the only gene in an intense care ward of a hospital. Filters If you can not take medicines to thin your blood, a filter may be inserted into a large vein- the vena cava 0 in your abdomen. A vena cava filter prevents clots that break loose from lodging in your lungs. Compression stocking. This help prevents swelling linked with deep vein thrombosis. These stockings are worn on your legs from your feet to about the level of your knee. This pressure helps decrease the chances that your blood will pool and clot. You should wear these stockings during the day for at least two to three years if possible. COmpresion stockings can help prevent postphlebitic syndrome. Take any prescribed medications as directed. If you have surgery, such s orthopedic surgery; you probably be given blood thinners while you are in the hospital. Your physician may also recommend aspirin or other medications that help prevent clots to be taken for a while after surgery. Avoid sitting still. If you have had surgery or have been on bed rest for other reasons, try to get up and start moving as soon as you can. If you are sitting for a while, try not cross your legs since this can limit blood flow. If you’re traveling a long range by car, stop every hour or so so you can walk around. If you are on a plan, try to stand or walk occasionally. If you ca not get no that at least try to stretch, move and exercise your lower legs. Try raising and lowering your heels while keeping your toes the floor, then raising your toes while your heels are on the floor. Make lifestyle changes. Lose weight, and stop smoking now. Obesity and smoking increase your risk of deep vein thrombosis. Get routine and continual exercise. Exercise lowers your risk of blood clots, which is of particular importance for people who have to sit a lot or travel frequently.